Mary Lou Doolittle, 95, of Webster City went to be with her Lord and Savior on Thursday, January 24, 2019 at Crestview Senior Living under the care of Unity Point Hospice. January 29, 2019 at 1:30 p.m., with burial at Cass Center Cemetery. Mary Louise Seamands was born on August 13, 1923 to Lewis (Art) and Lucile Seamands. 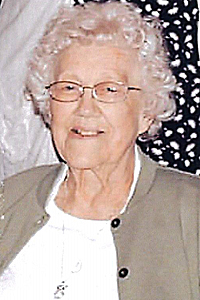 She graduated from Webster City High School in 1941. She worked at the Forrester Creamery and Hahne Printing Co. in Webster City. In 1943 she moved to Wenatchee, WA and worked at the Regional Agriculture Credit Corp. Mary Lou then moved to Washington D.C. in 1944 and worked for the Census Bureau during WWII. She enjoyed sightseeing with girlfriends during her travels. In 1947 she moved back to Iowa and worked for State Finance in Des Moines. In 1952 she was united in marriage to Keith Doolittle at the Little Brown Church in Nashua, Iowa. They enjoyed 54 years together. They raised their family of 5 on the Doolittle family farm just north of Webster City. She loved hymns, the Iowa State Cyclones, Peanuts comics, time spent with family, and the sweeter things in life. Mary Lou is survived by her son Wendell (Eileen) of Webster City, daughters Barb (Don) of Harlan, Sue of Webster City, and Karen (Don) Jorgensen of Omaha; brothers Roger Seamands of Cedar Rapids, Bob (Charley) Seamands of Chesterfield, MO; grandchildren Lindsey Doolittle, Kelsey (Rocci) Canovai, Jared Doolittle, Derek Jorgensen, and Jill Jorgensen; and several nieces and nephews. She was preceded in death by her parents, husband, daughter Jana, brother Jim, and a brother and sister in infancy. She was an active, lifelong member of the Church of Christ and a member of the B-Neighborly Club. Memorials may be left to the Webster City Church of Christ, Kendall Young Library, or Access.